The Colorado State University School of Music, Theatre and Dance closed out its mainstage season with Urinetown, an early 2000s Broadway hit every bit as irreverent as the title suggests. Following a devastating 20-year drought, a corporation has popped up with a bold solution to a water shortage crisis: a ban on private toilets. Citizens now line up to pay exorbitant fees to use public restrooms. If they can’t scrounge up the fee, it’s a first-class ticket to somewhere called “Urinetown”… from which no one has ever returned. After yet another fee hike, enough is finally enough — a revolution begins. CSU junior Jake Cuddemi is Bobby Strong, the young upstart hero who becomes the voice of the resistance. Cuddemi is pure gold, deadpanning his way through intentionally campy songs (“Follow Your Heart,” “Look at the Sky”). He gradually dials up the comedic vamping, never letting the energy dip as the plot becomes more and more ridiculous. Cuddemi’s co-star, junior Sydney Fleishman, gives a similarly solid performance as Hope Cladwell, bright-eyed daughter of the evil corporation’s moneygrubbing president. In listening to the Urinetown soundtrack, I never felt that Hope Cladwell was much more than a plot device: her job is to be pretty, naive and, later, kidnapped. Luckily, Fleishman manages to find more fun and sparkle in her Hope. She also has the pipes for the role, even if a few songs lean toward the operatic. Other standouts include Charlotte Nickell as the plunger-wielding Penelope Pennywise, crude gatekeeper of the public toilet; Karlie Murray as Little Sally, doe-eyed urchin who aids in the story exposition; and Bruce Gammonley as nefarious Caldwell B. Cladwell, exploiter of the poor. Daniel Isaacs holds his own as Officer Lockstock, but his lines were often muddy — considering that Lockstock is also the narrator and primary fourth-wall-breaker of the show, this becomes a challenge throughout the production. This Urinetown has other challenges as well; overall it lacks fluidity. Set pieces seem to have been built nearly as wide as the doorframe they need to fit through, creating a lot of very delicate choreography that eats time. The stage is lit primarily by meandering spotlights that end up leaving many characters singing in shadows. Mics often cut in and out in the wrong moments of productions. 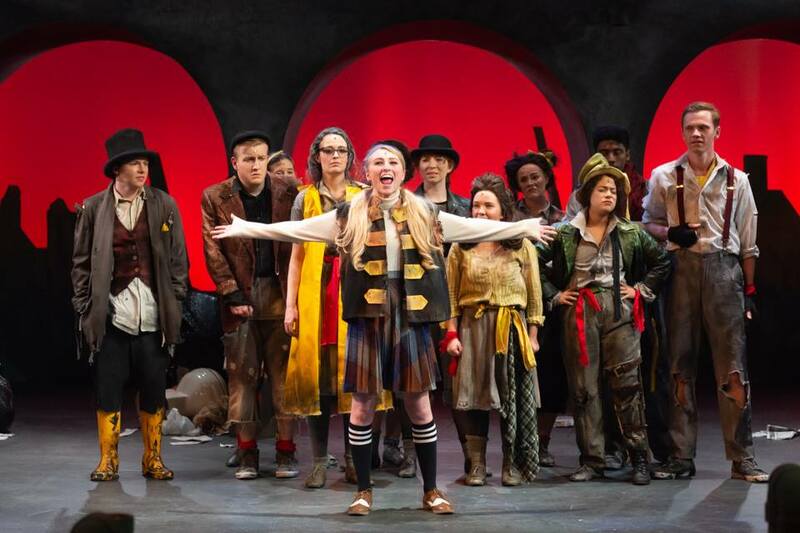 Those gaffs matter less in a show like Urinetown, where the focus is on the biting satire, comedic timing, and broad, cheeky ensemble numbers. (The pieces for the larger ensemble are almost invariably the strongest, both because the group was tremendous when in unison and also because the audio levels seemed to be tuned to those numbers, making them the clearest.) Urinetown is a perfect choice to showcase the range of talent in a university, even including a sewer full of live musicians. (I was unable to find the orchestra credited in the program book.) Guest director Richard Cowden has assembled strong cast and has allowed them to enjoy themselves. The fun is catchy. CSU has ended their theater season on a high note — a goofy note, an absurd note, but a high one nonetheless. Erica Reid is a member of the American Theatre Critics Association.